Hello everyone. 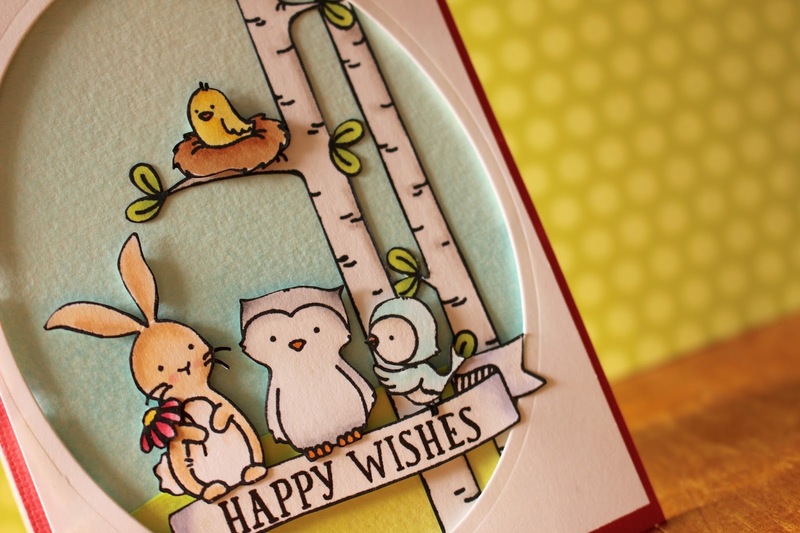 I'm back with another card video today featuring the Woodland Wonders stamp set by Avery Elle. I haven't bought any Avery Elle products in such a long time, but couldn't resist this one. To start off the card I stamped and coloured all of my images. I used Memento Tuxedo Black Ink for all the image stamping and then used Copic markers to do my colouring. I then decided to fussy cut them all out right on the line instead of leaving a white border like I usually do. To do my panel I die-cut out an oval using a Kaisercraft die just out of some Neenah white cardstock. I used the negative space to create a fun frame. For the background I cut down two pieces of watercolour cardstock. I then cut one of them down to create a hill. I used some Tumbled Glass and Twisted Citron distress ink to ink blend the sky and grass. I then adhered all my pieces together along with all the images and sentiment banner. I popped up my panel on some fun foam and then onto a hot pink card base. The video is linked down below and I hope you enjoy! Thanks for stopping by today and I hope you enjoyed!